Today you can get 30% off your purchase from any of the Gap brand stores. 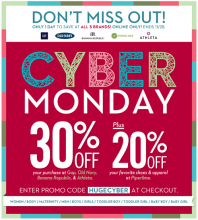 Head over to Gap, Banana Republic or Old Navy and use code: HUGECYBER at checkout to get your 30% off. PLUS they are offering FREE shipping on any purchase over $50. They’ve made shopping at their stores very easy. You can shop at all the Gap brands and have one shopping cart. This makes shopping and shipping very easy!